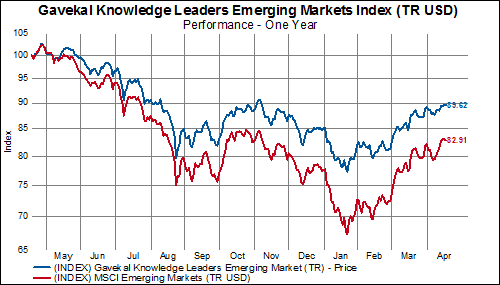 Are Emerging Markets Turning? A Brief Technical Tour. After reading no less than a handful of articles outlining the case for a rebound in emerging markets (with varying levels of conviction, of course), we thought a tour of the technicals might be helpful to get a better sense of where these emerging market stocks currently trade. Generally speaking, less than half of EM shares have a 50-day moving average above their respective 200-day moving averages (i.e. a ‘golden cross’ formation)– a big improvement from the 20% level that prevailed from last fall until March and with plenty of room for further expansion. 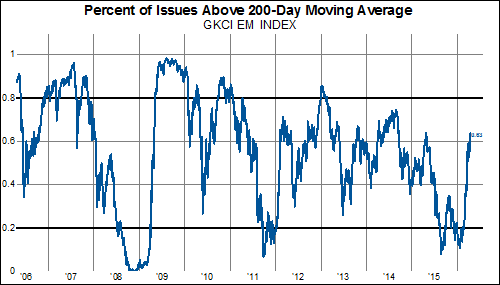 More than 60% of emerging market stocks currently trade above their 200-day moving averages– at (or very near) a level that has proven exhaustive over the last several years. 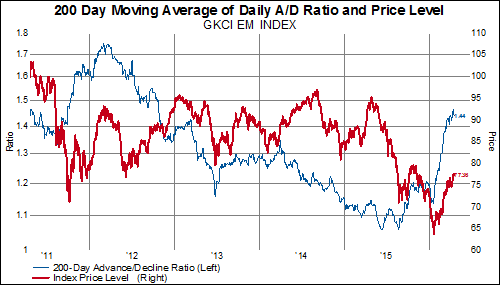 The 200-day moving average of the daily advance-decline ratio has reached levels not seen since 2012. Time for a rest or will this indicator power higher? Taking a look at net advances on a cumulative basis over the last year, we find that declining shares continue to overwhelm to a degree not seen since the financial crisis (and have now done so for a longer period of time– going in 14 months now). 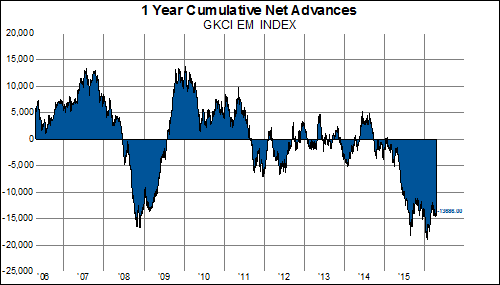 While net advances remained negative for 13 months starting in June 2008, the shift back to positive territory–once begun in earnest– only took five months, reaching highs just two months after that. 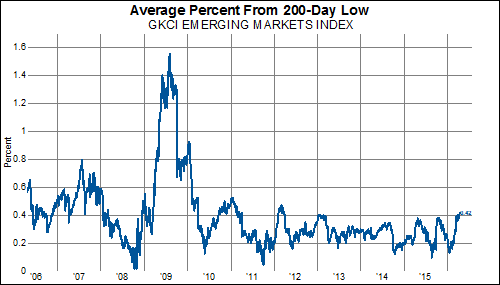 The number of companies in the Gavekal Emerging Markets Index that fell 5% or more over the last quarter is nearly back at its 10-year average, after spiking higher last fall. 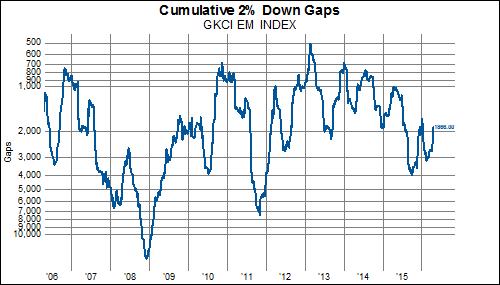 And gaps lower have abated as well. 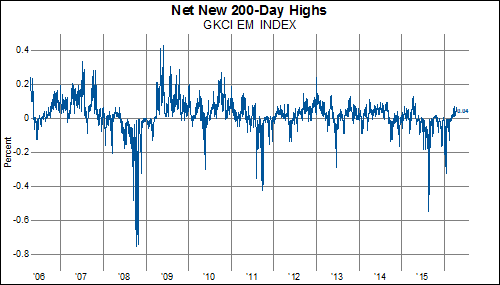 Though it may not look like much, net new 200-day highs turned positive at the end of March for the first time in nearly a year. 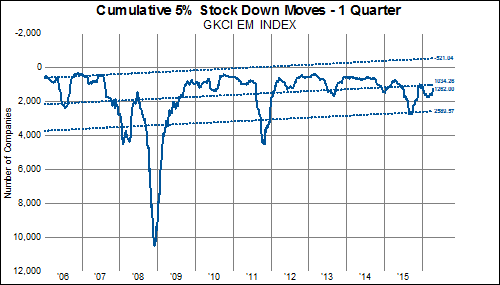 The average EM stock is actually up more than 40% from its 200-day low– a level it has not managed to surpass in a meaningful way since 2009. 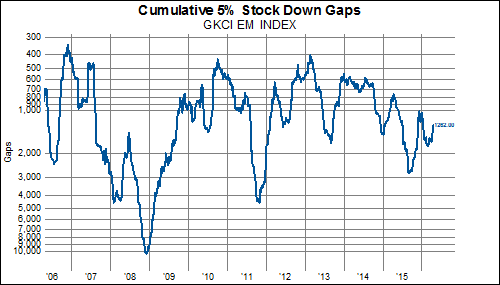 While this year’s EM stock rebound has certainly been impressive to this point, the sum of these market internals does not make an overly compelling case for a clear change in the group’s general trend at this time. Investors interested in emerging markets exposure might instead consider investigating how the Knowledge Effect manifests itself among highly innovative companies in the region (for more, see here, here, and here).